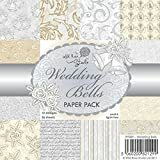 Traditional style ivory, silver and gold patterned paper pack designed to coordinate with the for making wedding cards and invitations. The pretty papers include swirls, bells, antique roses, stripes, elegant script and Victorian vignettes. The collection includes 36 patterned papers, with 3 sheets each of 12 different designs. Each sheet is about 15 x 15cm (6 x 6″) in size and is acid and lignin free.